A SharePoint Contact List is a one of the best “quick wins” for your intranet. As a collaboration tool, SharePoint has the word “share” built right into the name. Why not make it easy to for everyone to reach each other? And if you have an email and phone number for a suggested vendor or consultant, why not allow the rest of my team to access that information easily. 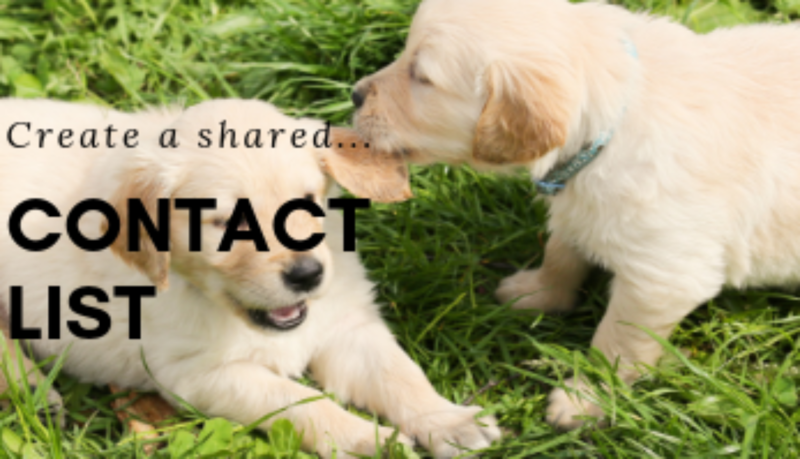 Let’s make contact information centrally available, always current, and persistent regardless of staff turnover. I am a strong believer in “I don’t need to know everything, I just need to know people who know stuff”. With that thinking in mind, let’s set our teams up for success and make sure people can easily contact each other. A high-priority feature of our communication and collaboration intranet is a well-designed and well-promoted Contact list. How can we centrally manage all contact information, share it among all staff, and easily search, update, and access it through Outlook? The contact list is another out-of-the-box SharePoint feature that is sometimes underutilized. With a few customizations and some education, it can do a lot. The most obvious use is the “one source of truth” place to keep names, phone numbers and email addresses for all the people you might need to contact. This could include internal (managers and colleagues) and external (vendors, travel agents, media contacts, etc.). And then there are the less obvious uses, like listing committee membership, emergency contacts, and even generation an organization chart. I suggest you download the hand-out to follow along with the video and refer to the details. One reason to write a book was to give back; to share my experience with others. 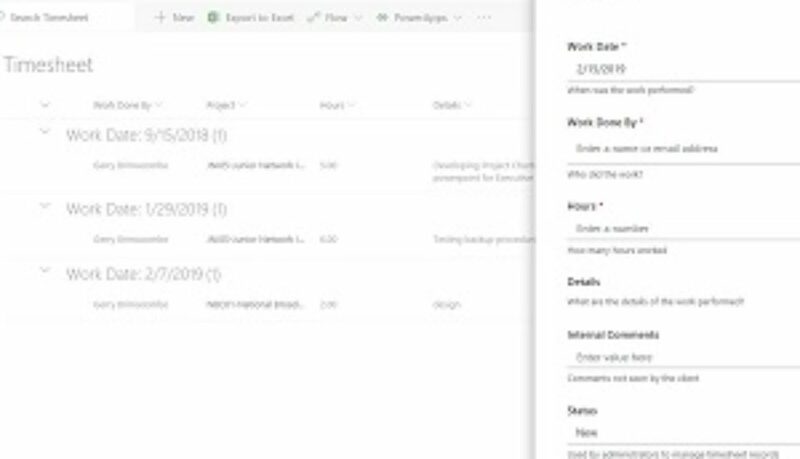 Today’s offering is a simple timesheet, enabling your SharePoint users to track hours spent on project, or client work, and allowing administrators or management to report and manage these records.. I hope this is useful to you! If you have successes, or questions or ideas, please let me know in the comments below. One reason to write a book was to book (pun intended) speaking engagements to travel to exotic locales (like Chicago) and spread the word about my consulting and SharePoint development. It’s happening! I’ve been invited to present for VisualSP later in February, and last night I did a talk for the amazing Vancouver Office 365 Users Group. In discussion with event organizers, I suggested speaking on project management, governance, user engagement and practical tools. In both cases the organizers selected a “practical tools presentation” gleaned from Part 2 of the SharePoint in Practice book. So I’ve developed how-to videos for several of the most popular tools, including step-by-step video instructions and a supporting handout with complete specifications. I will share these with you here. 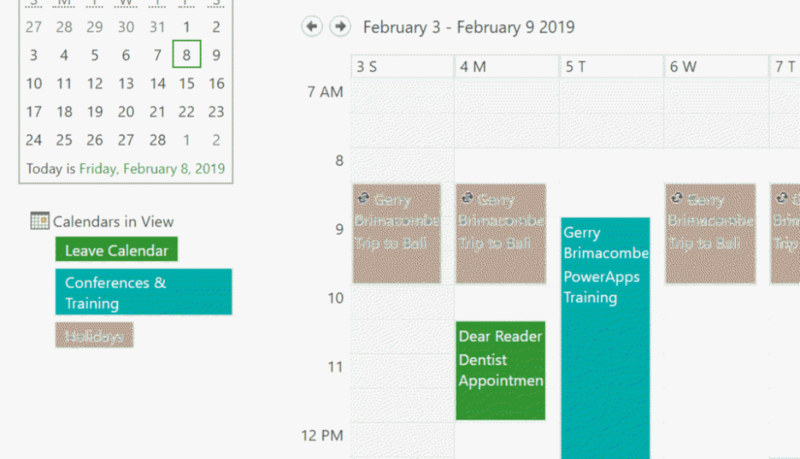 Today’s offering is a simple leave calendar, enabling your SharePoint users to view who’s away, post planned leave, and get manager approval. This is PART 2 of a series. Here we continue the discussion begun in PART 1. Reliable project status reporting is one of the most effective habits of a well-run project. 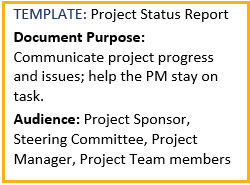 When planning your project, plan to produce weekly or bi-weekly status reports to distribute to the Steering Committee and other interested stakeholders. The status report is a short (1-2 page) format that quickly and colorfully shows the pulse of the project: what we are working on, what we need to resolve, and the current state of schedule and budget. The status report lets everyone know what’s up with the project, but there’s more! I have discovered over the years that a big added value of regular status reporting is to remind me (the Project Manager) of next steps and keep me cognizant of budget and schedule. Use your routine project status report as a regularly scheduled drumbeat of accountability that keeps you and everyone else on track and aligned with what was agreed in the Project Plan. Change is inevitable. When writing the Project Plan, we do our best to foresee what will happen and how the project will go, but that is never entirely accurate. Embrace this fact. Accepting the imperfection of your ability to see exactly what’s coming frees you to develop a project plan that is not stuck in the paralysis of analysis. Include change control as part of the plan from the outset so you can move forward efficiently. Set expectations and train the Steering Committee and the Project Sponsor that any change in the project, even if it is just a clarification and even if it doesn’t affect budget or schedule, will be documented with a formal change request process. Here again, attitude is important. The change request is planned and presented as a communication tool. A well-written change request helps the Project Manager quantify and clarify the impacts of every change. It also uses a standard structure that summarizes the impacts, so the Sponsor and Steering Committee can understand the change and make good decisions. Asking for sign-off of every change keeps the responsibility for project decisions where it belongs—with the Project Sponsor supported by the Steering Committee. The milestone when the new portal is complete and available to all users is called “Go-Live,” “Launch,” or the “cut-over date.” This is a key milestone, obviously, with a lot going on. 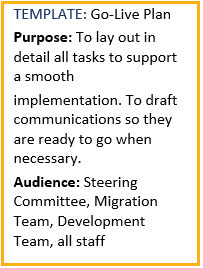 Referring to the Go-Live Plan template, you will see communication, technical, and training tasks connected to this event. If possible, schedule your Go-Live date to be a Monday, so you can work on final steps over the weekend, especially final migration and menus. The Monday timing also imparts a “fresh start” feeling, which can be very effective. When your organization doesn’t really have down time—for example, the operation is open all weekend—you may need to organize and communicate some “gray area” time, when the new portal will be in the process of being implemented and old systems might still be available. Well-timed communications are designed to keep stakeholders and the broader user base informed of what’s going on and when. There are few things people like less than a surprise when they are trying to work. You will find communications templates in the above Go-Live Plan. Note the attempt to be clear yet brief. This is challenging, so each communique starts with a brief sentence or paragraph that summarizes the critical information, and then proceeds to details, usually bulleted. You will also note that our Portal Purpose Statement is frequently reiterated (more about that in Chapter 3). 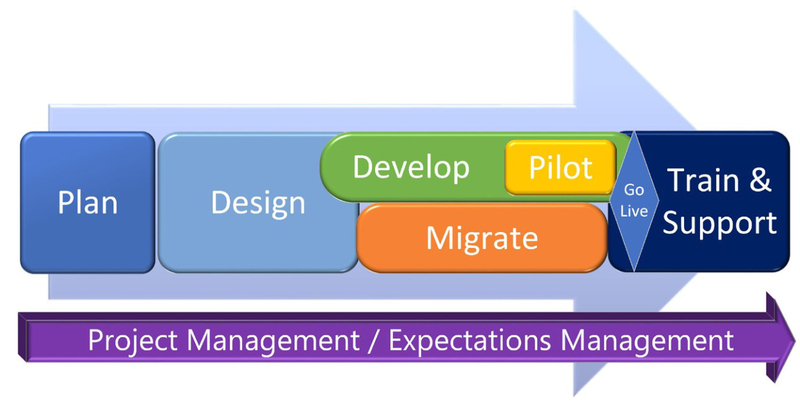 Migration: Is content completely migrated? Has metadata been set? Has a search full crawl run since content migration completed, so that the new content is searchable? If wiki pages were migrated, have all links been updated to point to the new site content? Theme: It is easy to change the SharePoint theme (colors, font, and Oslo vs Seattle layout). What makes this easy, of course, is our SharePoint in Practice KISS mentality, and therefore the use of standard templates without much programming involved. One potential challenge is changing from a Seattle theme, which has a Quick Launch on the left and a top menu, to Oslo style, which (strangely) eliminates the top menu and moves the left nav to the top of the page. Home Page: If you are building a site where the address remains the same—building in situ—then you can build the new home page during the development phase, and just before launch, use the Wiki Page command “Set as Home Page” to replace the old page with new. If you will be using a new web address, you will need to involve the technical or IT team to switch DNS settings. This process can take up to 48 hours, so plan ahead. Menus: When developing a SharePoint portal on top of an existing site, the switch to a new home page is simple. Not so with menus. As soon as you start to create a new top menu or the Quick Launch (left nav) menu, you run the risk of changing the behavior of the existing site before you or the users are ready. Consider the impacts carefully. You may find it best to build the menu in Managed Metadata in advance and deploy at the last minute, or you may just have all your menus and links in a file suitable for copy-paste and build the menus as part of the Go-Live activities. Training: You have been training your development team and executives throughout the project, and now is the time to get the rest of the company up to speed. If you expect to have a company portal that is heavily used by a broad user base for advanced document management and intense collaboration, plan some significant training. If, on the other hand, this will be a system where most people need minimal training, a Go-Live Webinar will be enough. This webinar is offered to all staff. See Go-Live Webinar in Chapter 9 for more details. Go-Live Contest: An effective training and engagement method is to develop a SharePoint Survey in a contest format. This “go-live contest” encourages users to walk through the new portal and develop basic skills training. This contest is mentioned here for completeness, and details can be found in Go-Live Contest in Chapter 6. TO BE CONTINUED…In this series, we are posting and expanding on the concepts in the SharePoint in Practice book. Please comment below: Do these concepts make sense to you? What are we missing? The 2nd edition of the book is already underway so please weigh in. Good project management is arguably the most important factor in successfully building a company portal. A well-planned and well-managed project will save money, reduce stress, and make everyone look good. Let’s see how we efficiently manage a portal development project. A Project Plan, like any document, is a communication tool. Its primary purpose is to clearly specify what is being done, when and at what cost to achieve the project outcomes, so the project can be managed. Always think of audience and purpose when writing anything. A key step early in your plan is to present the plan and get sign-off from the Project Sponsor. 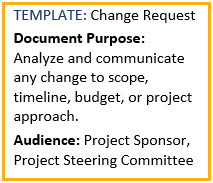 Remember the first element of the SharePoint in Practice mantra “TIKI” is “templates.” Start with a Project Plan or Project Charter template, involve stakeholders to create a rough draft, keep it simple, and go back to refine and clarify until everyone agrees and can sign-off. 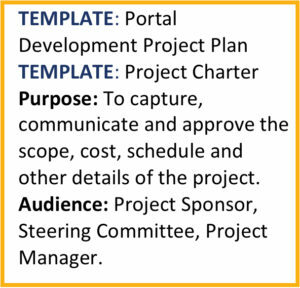 For smaller projects or those where the Project Sponsor or executive has less interest in detail, you can also use the Project Charter, which pares the plan down to just the basics. The crux of it is, your project management decisions result in trade-offs between these three constraints. a reduced budget mean you must do less or take longer, fitting the work in when you can or using lower cost, less skilled people (less cost = less scope and/or more time). In simple terms, ask the Steering Committee, early and frequently, “Do you want the portal good, fast or cheap? Pick any two!” Capture their choice in the Project Plan and manage accordingly. Your company portal touches all aspects of your organization, so be sure to involve the broadest possible set of executive sponsors. First, formally recognize and name a Project Sponsor. This is the manager or executive in the organization who represents the project amongst their peers to approve budgets, manage scope, and address issues. The Sponsor is your ally and your champion, supporting project execution and keeping you honest. 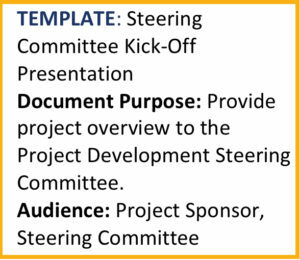 To create an efficient decision-making process in your project, form a Project Steering Committee. This group includes representatives from all the key divisions of the company, especially IT, HR, Communications, and Finance. Usually, the Steering Committee meets monthly and is chaired by the Project Sponsor. The actual task of running the meetings may fall on the shoulders of the Project Manager (you), and that is fine if the Sponsor has delegated that responsibility to you. Just make sure to keep meetings crisp, and don’t waste this group’s time. The Steering Committee receives and reviews project status reports and change requests and is invited to provide feedback and direction on all key project decisions. Remember that these people are just people, and they want to look good and feel good. Good project results are the best way to make the Steering Committee shine in the eyes of the corporation. Don’t waste their time but be prepared to (conscientiously) call or email a Steering Committee member between meetings if you need a quick decision or word of support. Getting approval signatures, or “sign-off,” of project milestones and documents is very important. Key agreements must be recorded so all project participants are able to look back at what was agreed when without relying only on memory. So, when the Project Plan (change request, the Design Document, etc.) is reviewed and approved, make sure to get a signature from the Project Sponsor and any other key stakeholders. Documenting a milestone is not the most important reason to get ink on paper, however. People will read a document more carefully when they know they will need to sign it later, so sign-off is in part an attention-getting technique. Make sure it’s clear—in the project plan and via face-to-face and email communications (yes, you will repeat yourself)—that these documents will need formal sign-off. As for obtaining sign-off, sometimes hunting down an executive with a signature page in your hand is the best way. However, if you don’t need a wet signature for legal or policy reasons, you can employ the simpler approach of emailing the executive with a message: “Please reply to this email to indicate approval of the attached.” Then screen capture and paste their email response onto the signature page of the document for filing. As Stephen Covey teaches in The 7 Habits of Highly Successful People, you must “begin with the end in mind.” You’ve clearly documented project goals and what needs to be done, by when, and how much it will cost. You have a plan that all have agreed upon and you’re done, right? Not so fast! It’s time to talk about expectations. Throughout the project, you must constantly manage people’s expectations. In a design meeting, someone may excitedly ask, “Can we also make the font larger for announcement titles?” or an executive will suggest, “Everyone is very busy, so can we just skip the next meeting?” Your answer is always along the lines of “Yes, but there’s a tradeoff.” Remember the Project Management Iron Triangle above? Stay positive and encouraging of everyone’s ideas—you want people to be creative—but always manage your budget, scope, and timeline. This means managing expectations. You will often hear consultants say, “under-promise and over-deliver,” which is another way of looking at expectation management. If you paint a picture that is too rosy—too optimistic—you may find yourself in trouble when things don’t go exactly as planned. By constantly, and sometimes subtly, managing the expectations of the Project Sponsor, the Steering Committee, the Design Team and others, you are keeping everyone on side with what we can realistically accomplish. (Yes, the “we” is emphasized—when done well, expectations management helps create a stronger team culture as we work together to overcome the constraints of time, budget, and schedule. So, what do we mean by “expectations management”? We’re talking about setting appropriate expectation all project team members and the executive—what can be delivered, by when. First, don’t just take the easy route of the pessimist and paint a picture of doom and gloom—the project team wants to hear that we can and will succeed. Do, however, stay realistic and cautious. Resist the temptation to say “yes” to everyone’s great ideas. 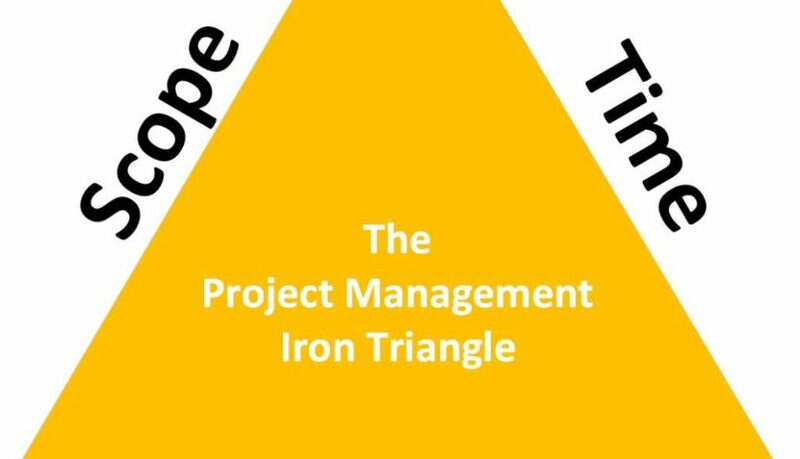 Keep the Iron Triangle in mind always. Refer to the Project Plan and use your knowledge of SharePoint to manage change. 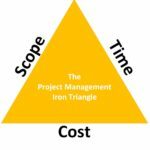 Change always affects the project triple-constraints. Explain how resources (time and money) are finite, and so we need to proceed judiciously. If we try to do too much, no one wins. Explain to your enthusiastic design team that out-of-the-box SharePoint solutions are easier to build and maintain by a factor of 10 or so, and when it comes time to upgrade SharePoint to a newer version, that install could well be complicated by any non-standard development work in place. Help them to choose. If it’s decided that yes, this change is worth the effort, then use the formal change request process to document the decision and get approval from the Project Sponsor. TO BE CONTINUED…In this series, we are posting excerpts from, and expanding on the concepts in the SharePoint in Practice book. Please comment below: Do these concepts make sense to you? What are we missing? The second edition of the book is already underway so please weigh in.